During the winter months here in Michigan many divers think of warm diving destinations as their only option to get wet. For those who are ready to dress for the occasion there is another option, Ice Diving!!!!! Last year we were denied the opportunity to engage in this very different yet cool (literally) for of diving. 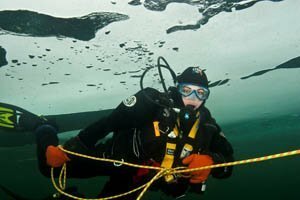 A special certification is required to engage in Ice Diving as the overhead environment demands additional safe measures. If you’re already a certified Ice Diver or looking to take the class and join on in this great experience call the store at 248-549-0303 today and get your name added to the list. We’ll be finalizing our plans shortly and contacting those who are interested with all the details. faloia https://www.recdiving.com/wp-content/uploads/2017/09/RecDiving_logo.jpg faloia2013-02-05 10:01:482013-02-05 10:01:48The lakes are frozen over, its time to dive!!!!! It’s hard to believe that it is February already. And before we take off on our next adventure, which is coming up soon, we wanted to let you know about our trip at New Years. We were fortunate enough to ring in this year at Anthony’s Key Resort in Roatan, Honduras. We have been here before and it never disappoints. This place is everything you would hope for in a tropical getaway. Beautiful, lush gardens lead to individual wooden bungalows, most with private decks, right at the waters edge – some even over the water. When we weren’t diving we could hang out by the pool or make use of the kayaks on the beach. A small shuttle boat can take you over to Bailey’s Key for the dolphin encounter. We could sign up to go zip lining through the jungle, horse back riding or just relax in a hammock. And the sunsets were incredible. We had our own boat and crew for the week and they took great care of us. Dive lockers where conveniently located close to the boat making it easy to manage our gear. A small snack shop on the dock was convenient for a quick treat between dives (sometimes you just need ice cream or Doritos when your having this much fun). The diving included three dives daily with two night dives and shore diving for anyone who still couldn’t get enough. The reefs were in great shape and we saw so many sea turtles on this trip it was almost funny. At the end of the night dives we settled down into the sand with the lights off and got to see what Roatan divers call “String of Pearls”. Long strands of lights that appeared and disappeared making for a magical dive. Some of the group added on a shark dive where we got up nice and close with more than a dozen Caribbean reef sharks. We also had the option of a dolphin dive which was of course amazing. The photographers and videographers in our group had lots of opportunities on this trip for some good pictures. Yes, we had a wonderful destination, but more important, we had a great group of divers who made it an extra special dive vacation. We had a new one on his first ocean diving trip and even one celebrating his 300th dive. We had divers who have traveled the world and still came back excited. Some joined us from Chicago and one has been joining us again and again from New York. These group trips are always fun for us! We would definitely recommend this place to anyone looking for a destination that offers something for new to experienced divers and even non-divers. Let us know if we can help you set up your next dive vacation. And stop by and tell us if you’ve been somewhere great recently.